Very cool set up for bathing/relaxing direct from hotel room (underground tunnels etc. 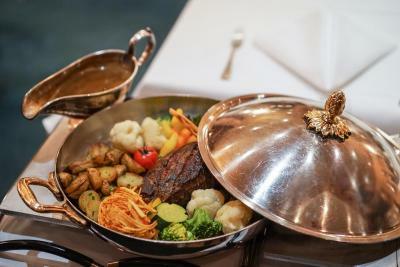 )Delicious and opulent breakfast! Beautiful location. Comfortable and calm. Great location. 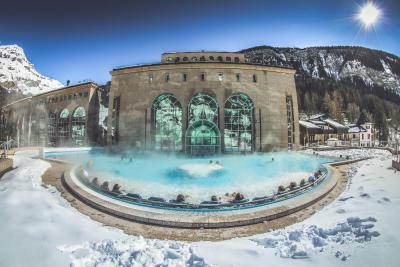 Thermal pools we're good. Included breakfast was exceptional. The receptionist Yves was very helpful. The spa area and thermal pools were wonderful! Great hotel right in the center, easily accessible by foot from the station. Wonderful breakfast and friendly staff. Very clean rooms. 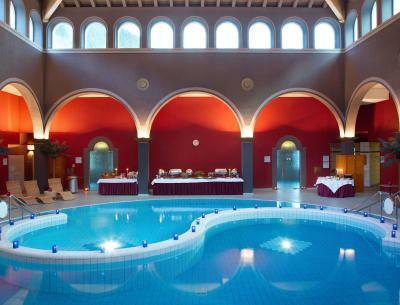 The best part of this hotel is that it had thermal baths!!! We hiked over the pass from Kandersteg with packs and soaking in the baths was a welcome relief. 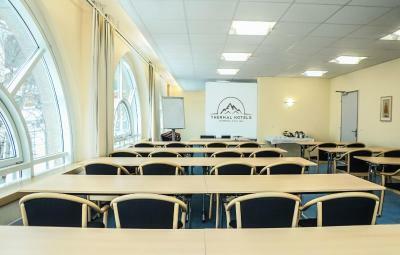 They are spacious and clean and there is a sauna, an indoor pool and an outdoor pool with jets. The room was nice--the typical Swiss room with two close together twin beds. Perfectly comfortable and plenty of space. I read a review saying the hotel was run-down---it is not. It is merely an old building. Imagine you have some flooring in your house that is perfectly fine but if you wanted to really show off and had money to spend, you'd replace it. But you don't need to. That's how our room was. The restaurant associated with the hotel across the street was fantastic! The breakfast was amazing--a magnificent spread. The staff kindly let us stow our bags during the day and use the baths all morning before we caught our bus to the next leg of our journey. 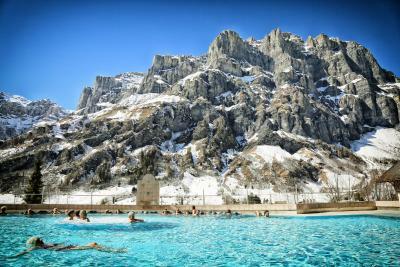 staff was nice and professional, they invited us to the thermal bath. Nice views and mountains. 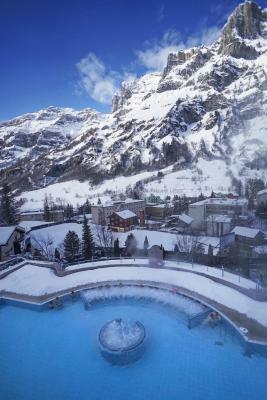 The baths and breakfast! Staff was awesome very helpfull! 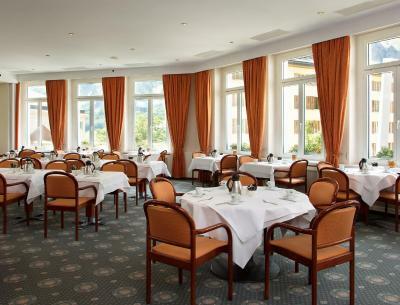 Thermal Hotels & Walliser Alpentherme Leukerbad This rating is a reflection of how the property compares to the industry standard when it comes to price, facilities and services available. It's based on a self-evaluation by the property. Use this rating to help choose your stay! 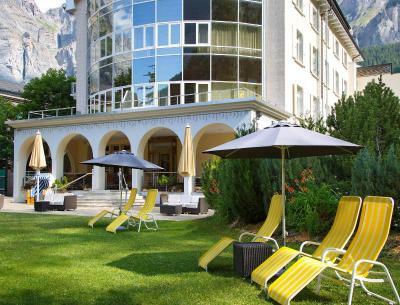 Located in the center of Leukerbad, surrounded by the Valais Alps, Thermalhotels Leukerbad offers spa and fitness facilities, direct access to the Walliser Alpentherme Thermal Complex, and a restaurant. Free WiFi is available throughout the property. 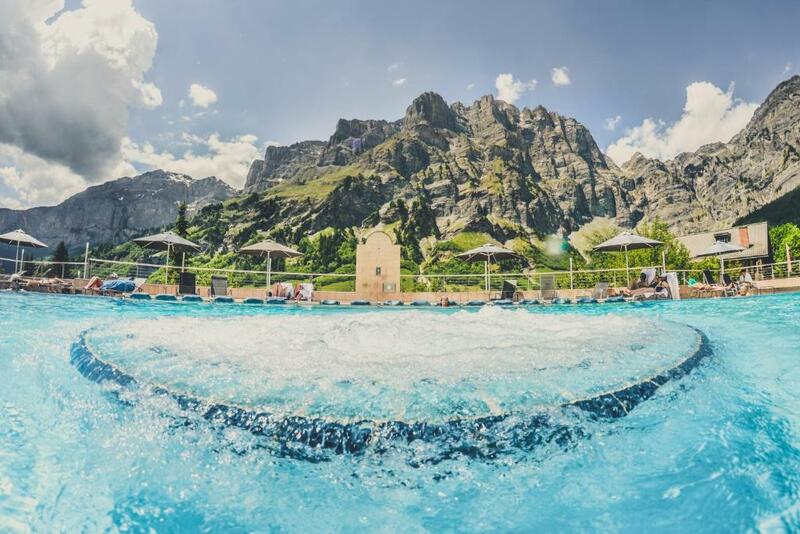 The spa and fitness facilities include indoor and outdoor pools, a sauna, a steam bath, a hot tub as well as outdoor tennis courts. 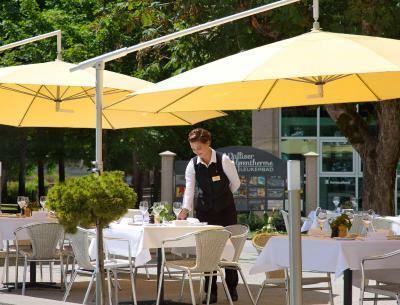 You can also relax in the spacious garden. 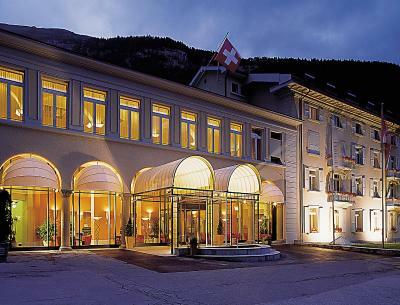 The rooms at Leukerbad Thermalhotels are spread over 3 neighboring buildings, which are connected to each other via an underground hall. 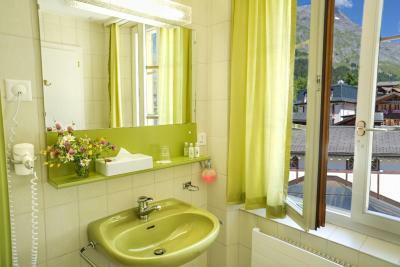 Each unit features bathrobes, slippers and cable TVs, and you can also enjoy panoramic mountain views from most rooms. 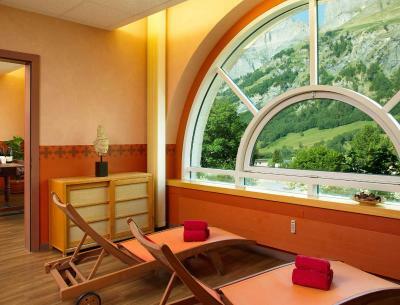 You can easily reach the Walliser Alpentherme spa via an underground hall. There you can enjoy various beauty and health treatments. 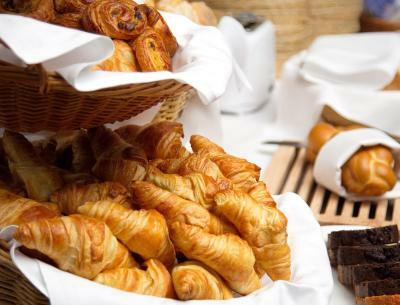 A rich breakfast is provided every morning in the Maison Blanche Restaurant. 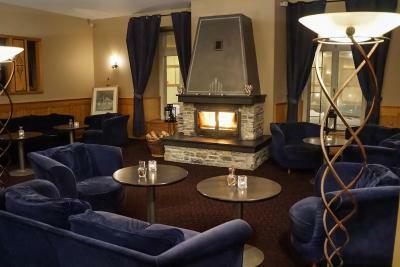 Fine Swiss cuisine and international specialties can be enjoyed in the Eau Là Là Bistro and the Sacre Bon Restaurant, and guests can relax in front of the open fireplace in the Grand Bain Bar. 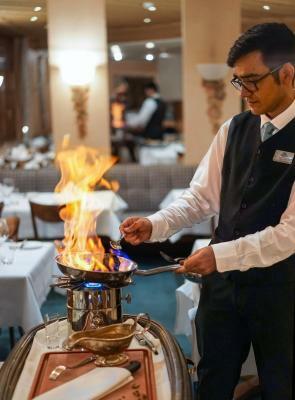 Guests can have half-board in the Sacre Bon Restaurant. 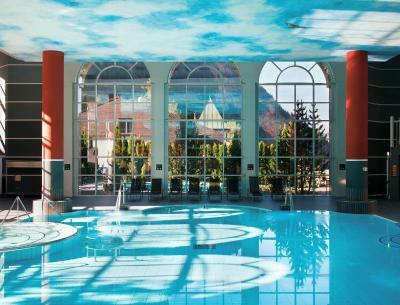 Guests will receive a 50% discount on the full-day entrance fee at Alpentherme. 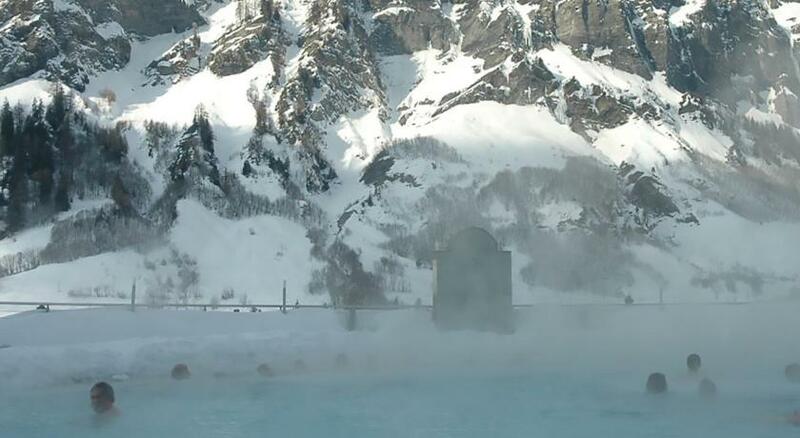 A 25% discount is offered in the Valais Sauna Village and Roman-Irish bath. 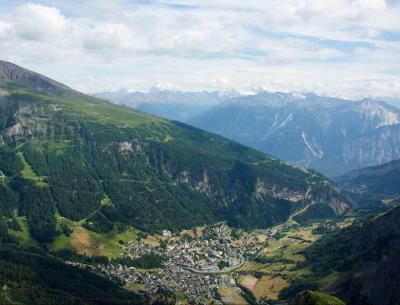 Upon request, free shuttle services within the village of Leukerbad are offered as well. 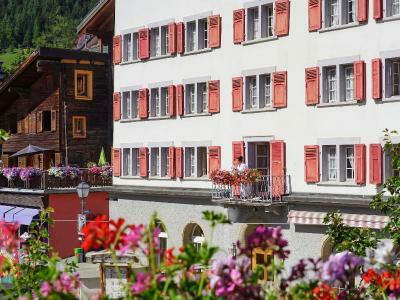 The Leuk Train Station is located 9.9 mi from the hotel, while the Leukerbad Bus Station can be found within a few minutes' walking distance. 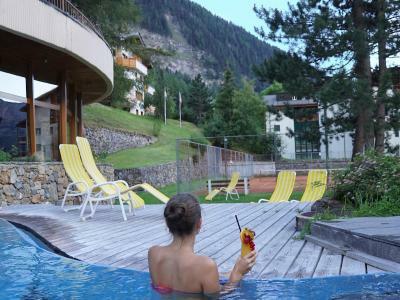 When would you like to stay at Thermal Hotels & Walliser Alpentherme Leukerbad? 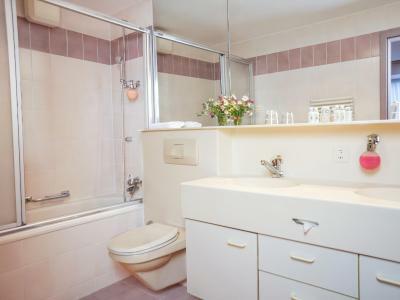 This single room features a mini-bar and bathrobe. 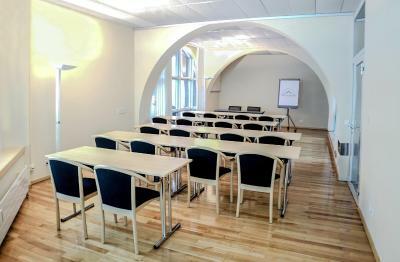 These rooms are located in the main building. 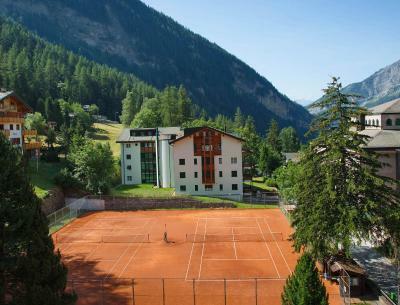 Public parking is available on site (reservation is not needed) and costs CHF 14 per day. This twin/double room features a mini-bar, cable TV and bathrobe. 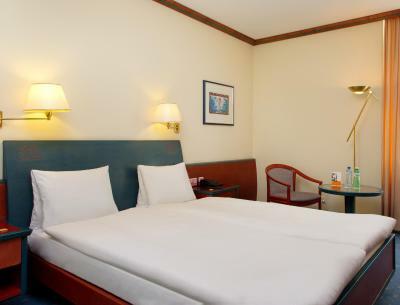 This double room features a bathrobe, mini-bar and cable TV. This suite has a mini-bar and bathrobe. Some rooms feature a balcony. This family room features a bathrobe and mini-bar. 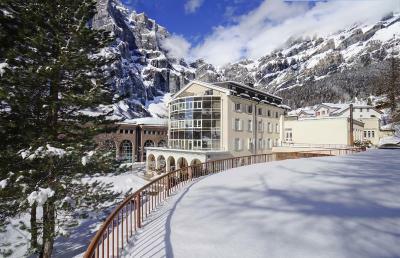 House Rules Thermal Hotels & Walliser Alpentherme Leukerbad takes special requests – add in the next step! 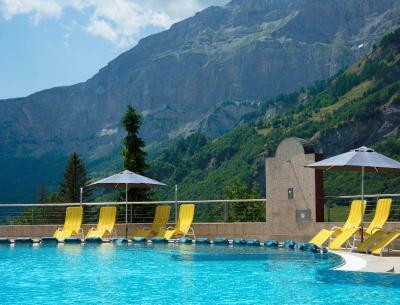 Thermal Hotels &amp; Walliser Alpentherme Leukerbad accepts these cards and reserves the right to temporarily hold an amount prior to arrival. 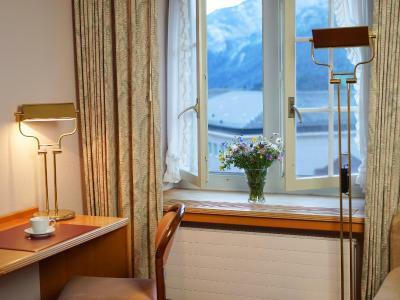 Thermal Hotels & Walliser Alpentherme Leukerbad accepts these cards and reserves the right to temporarily hold an amount prior to arrival. noisy Chinese tourists during one night (I stayed 4 nights), but this is not the problem of the hotel !!! The hotel will at one stage need some 'lifting' (renovation works), but the way it is at present is fine and functional. Unfortunately, quite a lot. I didn't think the price matched the hotel experience at all. Let's start from the beginning, on our way to our room there were tons of water stained carpets and I was a bit puzzled by that, but understood the overall problem the more I saw. Our room was fine, outdated but fine, the bathroom was filled with tons of calcium deposits and there was mold on the ceiling, which was really unfortunate especially since it was a raised bathroom/ shower hybrid. The main attraction, the pools were also not cared for at all, the wooden deck outside the pool perimeter was rotting, the pool tiles were grimy and everything looked old and stained. It was really misrepresented in the images on the site. I booked this hotel for my wedding anniversary and was just super disappointed by what we were expecting and the reality. The way this hotel is advertised is slightly misleading. 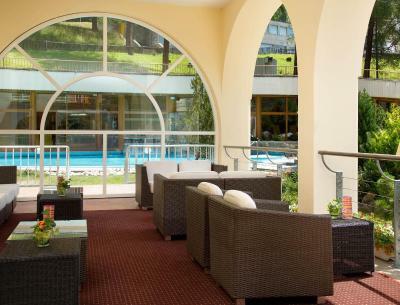 When booking, one would think the thermal spa is connected to the hotel however it is across the street and completely unrelated to the hotel. The hotel said we had a 10% discount but that did not match up with the desk at the spa across the street. 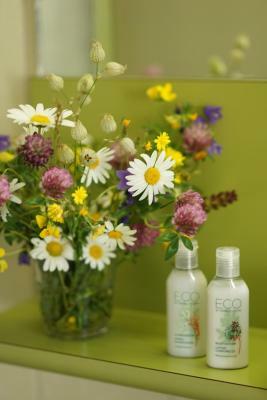 Really the perfect place to stay to have access the the best spa in town. There is a convenient underground tunnel so you just wear the robes and walk through there and you get 50% off the entry to the spa. 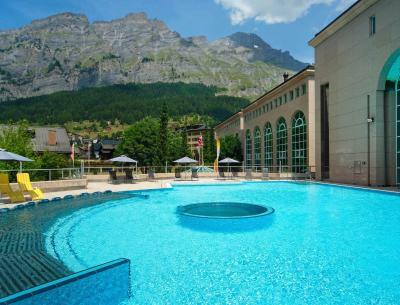 If you don’t want to pay to use that one, the hotel also has a great outdoor spa, grotto and sauna etc which is feee, all are awesome. 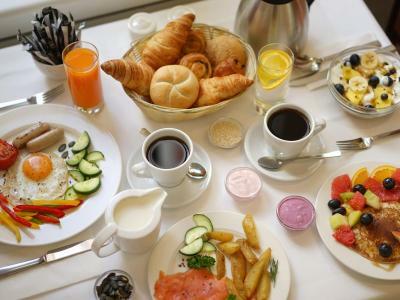 The breakfast at the hotel is fantastic.. it literally has everything... with prices in the town being extremely high, this breakfast is really really substantial and great that it’s jncluded in the room price! No kettle, tea and coffee in the room. Nothing in the minibar, not even a bottle of water. It is a pleasant hotel in a good location. 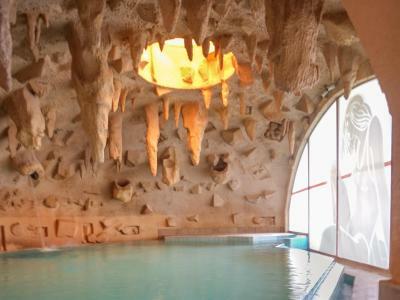 The best thing is that a bath robe is provided, you can walk through a tunnel to the thermal baths next door. Amazing place, worth every cent you spend for it. It’s hard to describe by the words how great it was. Very old interior, room we booked was with terrace in pict on booking but unfortunately it’s was not. Very beautiful location, therms you can reach from underground walk.